Logistics day plus a small ride today. Graeme and I were up and about early and breakfasted already for Colin arriving at my house around 9am with the hire car. 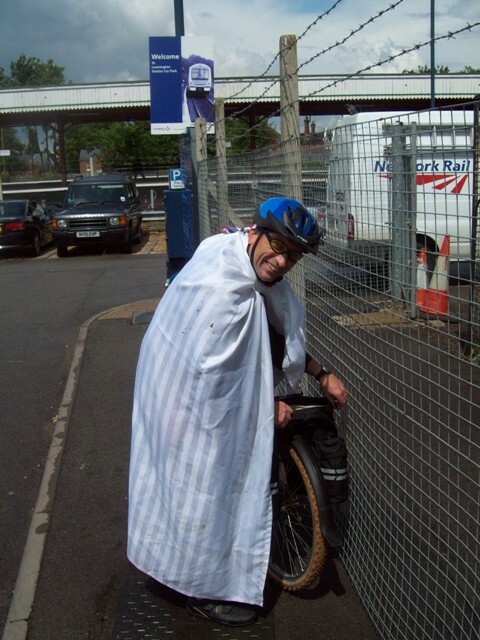 This year we were arranging a one way hire to Leamington Spa railway station, then cycle into Warwick to commence the ride. Also I had to drop a car off at Chesterfield at Jill’s house so I could get home later in the week. So via Chesterfield we had a fairly uneventful drive south to Leamington Spa. Hardest part was trying to find the railway station, while we were looking it was raining so we were not in a hurry. All were hoping it would blow through by the time we re fuelled and located the Hire centre and the railway station. We found the railway station and the Car park next door and decamped the bikes and while Colin popped next door and returned the hire car Graeme and I started to put the bikes together. The bikes went back together spot on, my new panniers fit a treat now first small problem, what to do with the shower curtain that I had thrown in the car to help protect the seats.? Thanks to terror bomb threats there are no waste paper bins around Railway stations anymore! Plus the skip bins they had were all padlocked. We need not have worried Colin decided to wear it to ride out of Town!!! No he didn’t ride out of town in it, we put it with all the other bags of rubbish in a pile outside Leamington Railway Station. It was at this point a bizarre incident happened Colin produced a mouth organ yes a mouth organ, no that was not the bizarre moment, that was when Graeme announced he could play it, he then proceeded to play “YOU ARE MY SUNSHINE” which I even recognised! A music theme for the ride, we collected other members for a band as we rode south, don’t believe me read on. Now the ride could eventually begin. A photo stop outside Leamington Spa railway station not the most picturesque in the world and then we in true Multidaymen style slipped quietly onto Cycle Route 41 which took us through a park and down a street and in around 20 minutes we were stood outside Warwick castle, ready to start where we had left off. The 2009 Ride starts here !! Photo shoot at the castle keep and then after thinking about going through the castle grounds and then fortunately thinking better of it just before a lady warned us of the many steps we would encounter. 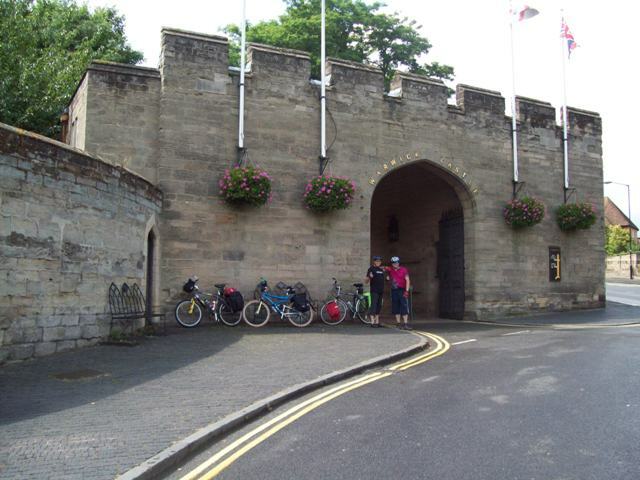 We cycled up into Warwick town and down past the Hilton hotel over the cycle route bridge which crosses the M 40 and we were into the Warwickshire countryside. Riding past several very well heeled properties and villages. The weather was overcast and we could hear the Thunder rumbling around. It was lovely flat riding, a few miles out of Warwick we stopped and had the packed lunch Colin's Karen had prepared for us. Thanks again Karen. And then onto to Stratford following the sustrans route 41. As we were nearing Stratford around Loxley village torrential started and the thunder rumbled around, nothing for it but head down and pedal, coming into Stratford first mini problem I hit a speed hump too fast and my panniers jumped off, it never happens in the dry! Ah well we cycled into the Town centre like 3 drowned rats fighting our way through the rush hour traffic too. Located the tourist information office, and a town plan showing our digs for the night the wonderful Cherry Blossom guest house. The lady allowed us to put our bikes in the garage, I’ve moved my car out just for you 3 she said on arrival, then showed us our family room. The photo shows only a small part of the tiny tight conditions 3 of us and our soaking wet gear had to put up with. Well it was only one night? No wonder she wanted money up front. Family room? We made the best of the room. It was tired and tiny. And we dried our gear best we could with a make shift bungee line. 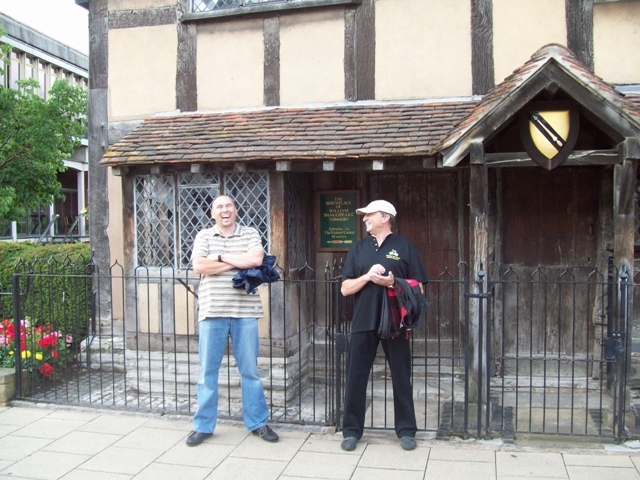 After drying out and changing we went out into tourist land which is Stratford on Avon. Passing signs outside pubs such as “Anne Hathaway’s Cottage pie“. We had quite an interesting evening in Stratford. The Pen and parchment pub , good beer and good service apart from the tall Gentleman in a trilby, open toed sandals and bandaged feet drinking wine at the bar and reading four books at the same time? And in doing so blocked off half the pub! Then onto Red Lion Table Table pub/restaurant next door for a great meal and some entertainment from a very very camp waiter who was so slow at serving that he gave us a free pint. We did have a laugh with him as we were leaving and paying the bill. He was interested in what we were doing in Stratford, we told him we were on a cycling holiday, he said You don’t look much like cyclists. I would put you down as K1 Fighters? This caused us great amusement even though we did not know what a K1 fighter was. So once back in the room we had Karen Google K1 fighters. Basically to sum it up they are some form of Martial arts Fighters. Ill leave you to do your own research!!!. 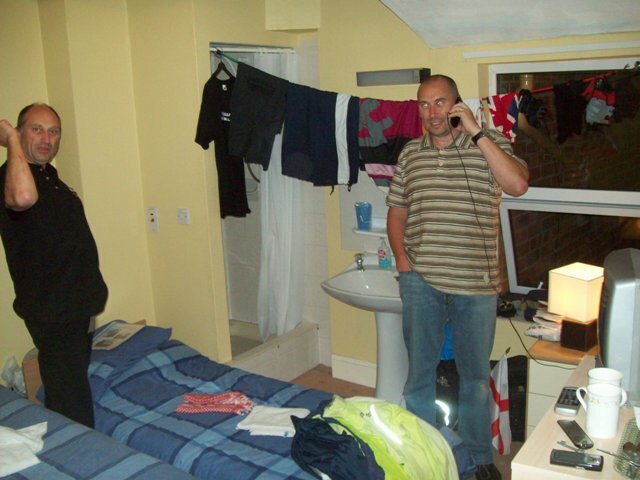 So we settled down to try and get some sleep in the cramped damp conditions.